After weeks of restoring the Teardrop American Outbacker, Mike and I took her on her first camping trip. 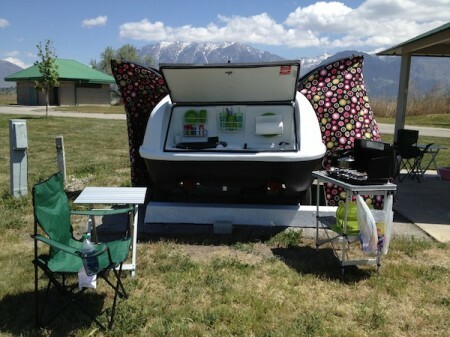 We are still a little worried about the windows leaking, so we camped VERY near home at Utah Lake State Park. She looked lovely at the campsite. It was a sunny weekend, but the wind was bitterly cold and relentless. Fortunately, the trailer kept us warm throughout the night. Mike said that he had never slept as good camping as he did in our new little trailer. When he said that, all the work that I had done to perfect the trailer suddenly felt worth it. Every layer of paint I sanded off, every turn of a bolt or screw, and every time I had to cut a cam shorter with a hack saw felt like time well-spent. All that I had hoped for in a trailer came true this weekend. It made camping easier, but it didn’t ruin it by turning it into just a home on wheels. It still felt like camping, but the two of us were able to sleep the night through despite the ragingly cold wind outside. 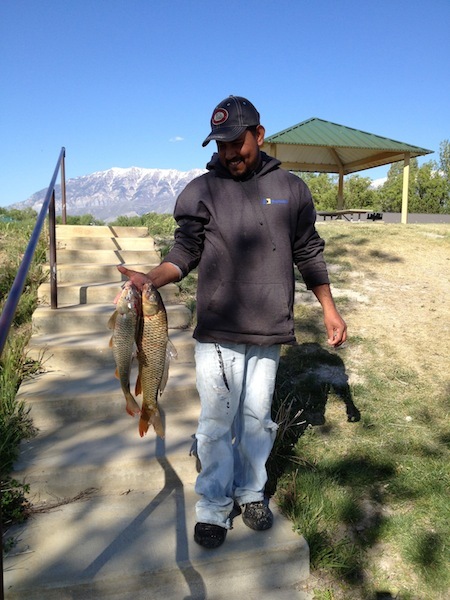 The camping fees at Utah Lake State Park were $20 a night, which included electricity and water at the site. There was a dump station for RV’s, but no sewer at each site (not that it mattered to us). They allow dogs on the campground, but not the beaches or in the water. There were clean and up-to-date bathrooms and showers onsite as well. Each site had asphalt for campers and plenty of room for pitching your tent on nice, soft grass. There were also shade pavilions at each site, but it was so cold that we didn’t want to be in the shade. We had to stay in the sun to keep warm. The lake itself was a dark and scary mass of water with waves caused by the wind last weekend, so Mike and I didn’t go kayaking on it. There were many people there on speed boats and along the shore fishing. I was so surprised at how big the fish were and how many people caught some. We passed this man at the end of Saturday and he looked so happy at his catch. Despite the cold, we had a lovely time camping at Utah Lake. It was just one of many trips camping in the teardrop that we’ll have. I’m so excited for the adventures to come!